the scent rising from the morning bakeries. red-and-white-striped popcorn barrels and their spillage. lemony citrines, rich grape amethysts, the icy mint of aquamarines. all that of the city she consumed. factories join her heart in pumping, pumping, working to ecstatic efficiency. ferries barging through her ears' canals. more gorgeous than the gardens budding in her armpits and groin. How marvelous to know such self-joy! Sandy Leibowitz is a native New Yorker who haunts carousels, dusty antique shops and bridges. She loves idyllic countryside but is most at home in cities. Her poems and stories appear in Goblin Fruit, Mythic Delirium, Luna Station Quarterly, Strange Horizons and other magazines. One of her poems is included in Ellen Datlow's The Best Horror of the Year Volume 5. She welcomes you to visit her online at sandileibowitz.com. 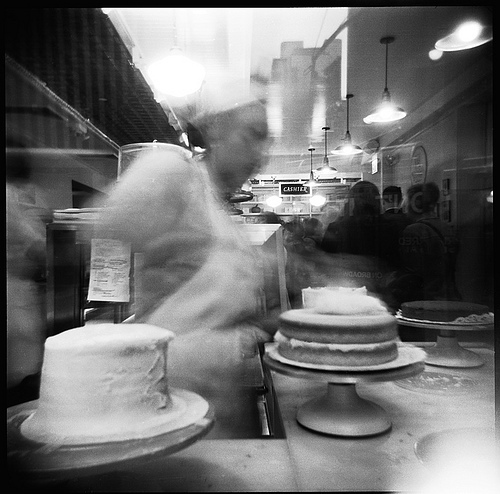 Photography: The Cake Lady, by Holly Northrop.